My full-time job centers around prayer. When I recently took an assessment of my personal prayer life and of the particular things I’ve been speaking to our Lord about, I realized time and time again that something pretty major was missing: thanksgiving. Instead of thanking God for ways He is continuously and constantly showing up, I’m often asking and grasping for more. If it’s not one thing, it’s another, and I find myself, daily, asking God for good things: to to be with me, to give me strength and healing, to give me peace and joy, or to guide me. The problem, however, is when I forget to thank God and to look for Him, even when I feel like my prayers aren’t being answered. Thanksgiving reminds us to discover God in our midst. It asks us to pay attention and to take note of God’s goodness, even when things don’t seem to be going so well for us. In today’s Gospel, Mark writes that Jesus rebuked the eleven apostles, “for their unbelief and hardness of heart.” (Mark 16:14) They didn’t believe those who had already seen the resurrected Jesus. The apostles were probably sitting together in deep grief. I can’t imagine that Jesus’ death was an answer to their prayers, but it was God’s will and it was, in many ways, an answer—very singularly—for each of those eleven men; for their salvation, and for ours. But when Jesus appeared in front of them, their hearts were hardened from their loss and their heartache. They probably didn’t feel like they had something they could thank God for at the time, or maybe they had stopped looking for Jesus (at least in the form the way that they used to know Him). As I look at the losses I’ve suffered and the heartache I carry, I realize how they have had the power to also make me hardhearted, and how I’ve given into that at times. I have stopped looking for Jesus in those moments because of my grief. This makes me realize that I too could be at the table, consumed with unbelief that Jesus was alive, because of my hard heart and because I wasn’t prepared to see Him in whatever shape and form He comes in. Today, I will look for Jesus with thanksgiving, be prepared for however He chooses to show up, and trust that He will. 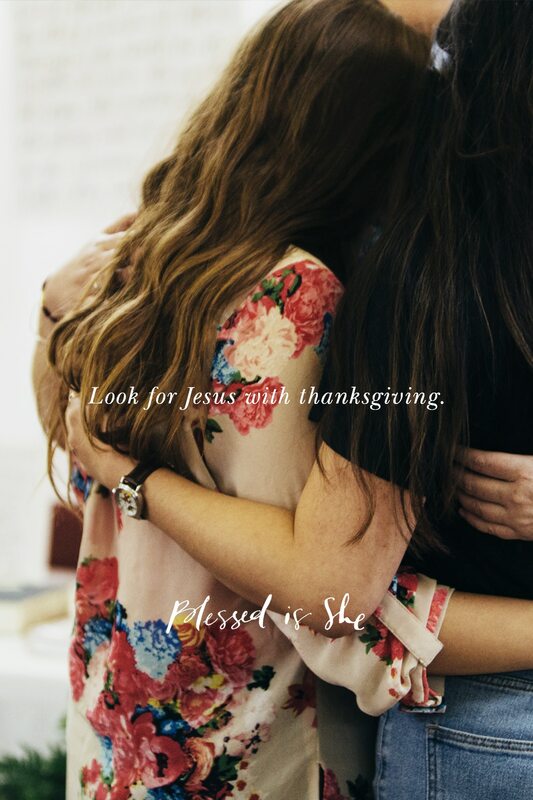 Today, I will look for Jesus with thanksgiving. Let us pray together, Soften my heart, Lord! I desire so much to see You.